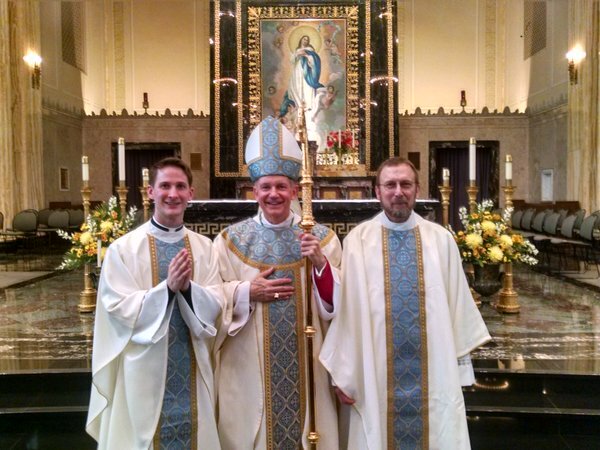 Yesterday morning, His Excellency the Most Reverend Thomas John Paprocki ordained two new priests for service in the Diocese of Springfield in Illinois in the Cathedral of the Immaculate Conception, Fathers Paul Bonk and Braden Maher. 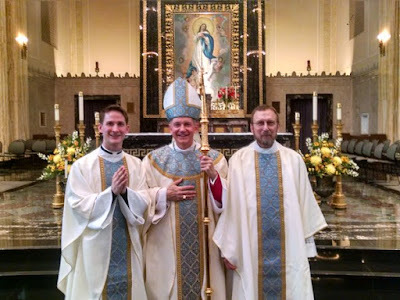 Father Bonk will serve as Parochial Vicar of Our Saviour Parish in Jacksonville St. Alexius Parish in Beardstown, St. Fidelis Parish in Arenzville, and St. Luke Parish in Virginia. He will also serve as Chaplain of MacMurray College in Jacksonville. Father Maher will serve as Parochial Vicar of the Cathedral of the Immaculate Conception and as Associate Master of Ceremonies to the Bishop. Congratulations, Fathers Bonk and Maher! Life in Rome is beginning to slow done even as it is picking up a bit of speed. By this I mean that our classes have now come to an end and we have a couple of weeks yet to prepare to for our final comprehensive exams (and pack for the long-awaited journey home). Since we did not have classes last week Wednesday through Friday, I decided to make a second visit to England with the express purpose of visiting the cell in the Tower of London in which King Henry VIII held Saint Thomas More prisoner. Access to this cell is not part of the usual admission to the Tower complex (because you have to pass through the Governor's house to enter the cell) so I made arrangements for this pilgrimage in advance to take place at 11:00 a.m. a week ago today. He was certainly not kept in your average dungeon. The Tower of London, after all, was both a royal palace and only housed prisoners of status; commoners - like William Wallace - would never have been housed in the Tower. Even so, his imprisonment cannot have been easy. After talking a bit about the relationship between King Henry and Saint Thomas, the Yeoman Warder politely excused himself for a few minutes to allow me time for personal prayer. After being alone in the cell for perhaps one minute, I could already feel that even in relative comfort, this would not have been easy. I could hear conversations from the tourists walking by outside the Bell Tower in which he was imprisoned. I could hear birds chirping outside the Tower. I could hear footsteps and voices from the hallway and rooms just outside the cell. What must it have been like to hear the approach of voices and of footsteps for fifteen months, never quite knowing if someone was coming to visit him or to tell him of sentence of death (which, from his writings, he seems to have suspected would be handed down for some time). Just thinking about how hard it must have been for him not to give in simply to be with his loved ones gave me an even greater respect and admiration for this man of truly heroic virtue. When he was first imprisoned, Saint Thomas had something of a comfortable life in the Tower (as far as prisons go). He had a servant to attend him, plenty of books and writing materials, and could receive visiting family and friends with ease. We entered through the door on the left. The space in the center was a fireplace. However, as the weeks turned to months and still the former Lord High Chancellor of England would not affirm King Henry as head of the Church in England, the monarch had one nicety after another taken from Saint Thomas until he was left only with the shirt on his back. This window looks out towards Tower Green, where the executions were held. From the above window, Saint Thomas may not have been able to see the actual execution of his friend Saint John Fisher, Bishop of Rochester and the only Bishop in England to stand against the king, (and who was imprisoned in the cell above Saint Thomas and with whom he communicated by letter) on 22 July 1535, but he certainly would have been able to see the assembled crowds and hear their cheers and cries. Everything he heard and saw must have stayed with him until he was executed two weeks later. I do nobody harm, I say none harm, I think none harm, but wish everybody good. And if this be not enough to keep a man alive, in good faith, I long not to live. And I am dying already, and have since I came here been divers[e] times in the case that I thought to die within one hour, and I thank our Lord I was never sorry for it, but rather sorry when I saw the pang past. And therefore my poor body is at the King's pleasure; would God my death might do him good. Saint Thomas had spent most every Friday of his adult life - even while serving as Chancellor - in prayer, contemplating the Passion of the Lord and many of his spiritual writings offer us some of the fruit of his prayer. It is this habit of mediating on the Crucified Lord that sustained Saint Thomas in his imprisonment. That he [Thomas] may not have erected this tomb in vain while still alive, and that he may not shudder with fear at the thought of encroaching death, but may go to meet it gladly, with longing for Christ, and that he may find death not completely a death for himself but rather the gateway to a happier life, I beg you, kind reader, attend him with your prayers while he still lives and also when he has done with life. His mortal remains were never placed within this tomb. I know well that the reason why you have condemned me is because I have never been willing to consent to the King's second marriage; but I hope in the divine goodness and mercy, that as St. Paul and St. Stephen whom he persecuted are now friends in Paradise, so we, though differing in his world, shall be united in perfect charity in the other. I pray God to protect the King and give him good counsel. These are truly the words of a saint and show us how to forgive our enemies. After his execution, Saint Thomas' head was impaled on a pike and displayed on Tower Bridge to serve as a warning to others (his daughter, Margaret, later bribed one of the guards and received his head, which is now buried in the church of Saint Dunstan in Canterbury in the Roper family's vault). Saint Thomas body was hauled back inside the Tower and buried - with 1,500 other bodies - beneath the floor of the Chapel Royal. Some time later, repairs were ordered to the Chapel Royal and, in order to install a heating system, the bones of these 1,500 executed persons were removed and interred in a common crypt within the Chapel Royal. The entire pilgrimage within the Tower to the cell and crypt (including the tour) lasted just one hour, but left a very deep impression on my heart. I am deeply grateful to the Yeoman Warders for their many kindnesses to me and for allowing me to make this pilgrimage. Touched by an unusual grace, he discovered that he was different than he had been when he had entered. Even though its lips were only painted, the image of Christ crucified spoke to this man who had been moved in this way - something unheard of over the centuries - and called him by name, "Francis," it said to him, "go and repair my house which, as you can see, is in ruins." The trembling young man was dumbfounded and felt faint, but he was immediately prepared to obey and everything became focused on that order (Second Life, I.VI.10). Ever since that day, the San Damiano crucifix has been treasured by the Franciscan family and all those who seek to imitate Francis' love of the Crucified Love. Assisi, June 15-19, 2016, the Crucifix of San Damiano returns to the place where it spoke to Francis of Assisi. To respond to this appeal, the community of Friars Minor of San Damiano and the Poor Clares of proto-monastery of St. Clare, with the patronage of the Diocese of Assisi-Nocera Umbra-Gualdo Tadino and the municipality of Assisi, have desired to return the Crucifix of San Damiano, after almost eight centuries, to its original location. It should be remembered that the face of Christ displayed in the San Damiano crucifix is the same face as that found on the Veil of Manoppello. Likewise, if you missed my post exploring the centrality of the Veil of Manoppello with the history (and origin) of the jubilee, be sure to give it a read. For the past one hundred and ten years, the Papal Basilica of the Sanctuary of the Holy Face has published a magazine to promote devotion to the Volto Santo, the Holy Face of Jesus present on a piece of byssus - a cloth made from the silk of mollusks - found by the Apostles Peter and John in the tomb of Christ Jesus (cf. John 20:6). This magazine has now been published in English for the first time. Under the editorial hand of Mr. Antonio Bini, various articles, stories, and homilies from the past few years have been translated and included in the book titled, The Holy Face: From Manoppello to the World. I am happy to say the two homilies I translated by Archbishop George Ganswein and by Archbishop Edmond Y. Farhat are included in this volume. On his excellent blog, The Holy Face of Manoppello, Raymond Frost has posted a link to the full text of this special volume. I encourage you to follow his blog for news and photographs of the Volto Santo and to read The Holy Face: From Manoppello to the World. It is hoped that additional English volumes will follow. In his introduction to The Holy Face, Father Carmine Cucinelli, rector of the basilica, referred to those of us who contributed to the book as "witnesses and disseminators of the Holy Face." 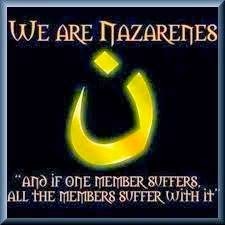 Please remember us - and, more importantly, our efforts to make the Holy Face more known - in your prayers. The opening words of the Bull of Indiction of His Holiness Pope Francis for this Extraordinary Jubilee of Mercy highlight with great subtlety – and almost certainly unintentionally – the history of the first Holy Years: “Jesus Christ is the face of the Father’s mercy.” This theme of looking upon the face of Jesus, of gazing upon mercy, runs like a golden thread throughout the entire text of Misericordiae vultus and points even to the very origin of the Christian jubilee, as we shall see. But how is it possible for us to gaze now upon Jesus Christ, upon him who “is the face of the Father’s mercy”? We can do so by gazing upon “the napkin which had been on his head” the Apostles Peter and John found in the tomb of Christ “not lying with the linen cloths but rolled up in a separate place by itself” (John 20:7). This napkin, the holy sudarium, is now housed at the Shrine of the Holy Face in Manoppello, Italy – some two hours east of Rome - where it is known as il Volto Santo (the Holy Face). This mysterious piece of byssus (sea silk) was called the Veronica when he it was kept in Rome in the Basilica of Saint Peter. Before his gaze all falsehood melts away. This encounter with him, as it burns us, transforms and frees us, allowing us to become truly ourselves. All that we build during our lives can prove to be mere straw, pure bluster, and it collapses. Yet in the pain of this encounter, when the impurity and sickness of our lives become evident to us, there lies salvation. His gaze, the touch of his heart heals us through an undeniably painful transformation “as through fire”. But it is a blessed pain, in which the holy power of his love sears through us like a flame, enabling us to become totally ourselves and thus totally of God. In a particularly way, we also find this theme of looking upon the face of Jesus in the Bible in the prayer the Holy Father composed for this extraordinary jubilee. Addressing the Lord Jesus, Pope Francis echoes the words of the Psalmist Asaph, “Show us your face and we will be saved” (cf. Psalm 80:4). It is a plea we find repeated throughout the Scriptures. King David sang, “Many say, ‘May we see better times! Lord, show us the light of your face’” (Psalm 4:7)! In another Psalm, King David sang, “Let your face shine on your servant; save me in your mercy” (Psalm 31:17). Another of the psalmists sang, “May God be gracious to us and bless us; may his face shine upon us” (Psalm 67:2). In a psalm of the Korahites, we sing, “Show us, Lord, your mercy; grant us your salvation” (Psalm 85:8). The Pslamists continually prayed to look upon the face of God, yet the Lord God said to Moses, “you cannot see my face, for no one can see me and live” (Exodus 33:20). This is why Hagar, after speaking with “the Lord’s angel,” asked, “Have I really seen God and remained alive after he saw me” (Genesis 16:11, 13)? Jacob, too, after wrestling with the angel, marveled that “I have seen God face to face … yet my life has been spared” (Genesis 32:31). Moses, too, spoke to the Lord “face to face, as a person speaks to a friend” (Exodus 33:11). Still, this was a privilege granted only to a few; God had not yet revealed himself fully. Considering these verses, we might say that the Father’s mercy is his face. Is it not his mercy that moves the Lord to reveal himself? After all, at the beginning of his Gospel, Saint John tell us, “No one has ever seen God. The only Son, God, who is at the Father’s side, has revealed him” (John 1:18). Is this not why “the Word became flesh and made his dwelling among us” (John1:14)? Indeed, it is in the very act of showing his face to us that Jesus reveals the Father’s mercy. This is why Jesus said to the Apostle Philip, “Whoever has seen me has the seen the Father” (John 14:9). It is first all necessary to let the Blessed Virgin take one by the hand to contemplate the Face of Christ: a joyful, luminous, sorrowful, and glorious Face. Those who, like Mary and with her, cherish and ponder the mysteries of Jesus assiduously increasingly assimilate his sentiments and are conformed to them. Truly, much as in the Holy Rosary, we see the life of Jesus in his Holy Face and become like him as we ponder its mysteries. In his first letter, Saint John tells us “we shall see him as he is” and Saint Paul tells us we will see him “face to face” (I John 3:3; I Corinthians 13:12). More importantly, Jesus himself tells us the clean of heart “will see God” (Matthew 5:8). Each of these texts speak of a vision in the future, but if we have not seen the face of Jesus, how will we recognize him when we stand before him “in his glory, and all the angels with him” (Matthew 25:31)? We often speak of the tomb of Jesus as being empty on the morning of Easter, but a close examination of the accounts of the Resurrection - such as they are - reveal something quite different. Regarding the burial of the Lord, Saint Matthew tells us “Joseph wrapped [the body of Jesus in] clean linen and laid it in his new tomb,” a detail also recorded by Saint Mark and Saint Luke (Matthew 27:59; Mark 15:46; Luke 23:53). Saint John, however, refers to “burial cloths” - in the plural - used to bind the body of Jesus “according to the Jewish burial custom” (John 19:40). Saint Luke, however, adds a curious detail, not recorded by Matthew and Mark, when he describes what Saint Peter saw when he entered the tomb: “But Peter got up and ran to the tomb, bent down, and saw the burial cloths alone” (Luke 24:12). Whereas before he referred only to one cloth, now he speaks of more than one cloth. The tomb, then, was not empty; there were cloths inside! When Simon Peter arrived after [John], he went into the tomb and saw the burial cloths there, and the cloth that covered his head, not with the burial cloths but rolled up in a separate place. Then the other disciple also went in, the one who had arrived at the tomb first, and he saw and believed” (John 20:7-8). We have, then, several cloths used for the burial of Jesus, but what were – or are – these cloths? The most famous of these cloths, of course, is the Shroud of Turin, an inexplicable image depicting the body of a dead man, a man who suffered greatly and whose body shows signs of having been crucified. Christians throughout the ages have believed this cloth to be the piece of linen referred to by the Evangelists and see in it the image of Jesus, lying dead in the tomb. Some even try to use it to prove the Resurrection of the Lord, but this is not possible. The image very clearly shows a dead man. The Shroud of Turin can prove that a man died a horrible death. It cannot be the Shroud that caused the beloved disciple to believe because he already knew Jesus was dead and he certainly needed no further proof of this. Still, the Shroud of Turin is not important, for it is, as Paul Badde calls it, “the map of sufferings,” it does not prove the Lord lives. There is another cloth held in Oviedo, Spain, which is called the Santo Sudario, the Holy Napkin, where it has been preserved since the eighth century. This cloth bears no image, but contains stains of blood and water found on both sides of the cloth. These stains correspond to the dimensions of the lower half of a man’s face. As this man was dying, an edema must have formed in the lungs. When he died, he had spouted blood from his mouth and nose. There was such an enormous gush of it that the hand of some nearby pious Jew – for Romans were not so squeamish in such matters – must have quickly seized this cloth and pressed it against the face and the mouth of the dead. He had wrapped it over again, doubled, because the dead man had been bleeding so freely, and then wrapped it around the back of the man’s head before tying the whole cloth in place… The nose had been broken. If we compare the dimensions of the head on the Shroud of Turin and the dimensions of the dead man hidden in the Santo Sudario, the dimensions are the same; these two cloths once covered the same body. Once touched to his face, the Santo Sudarioh was not moved about to clean the face, but was bound over the face beneath the Shroud of Turin. Here, then, is a second burial cloth. It is said that this cloth also came out of the tomb of Jesus, that it was the last cloth placed upon his face. This is the cloth John saw in the tomb and because of which he believed in the Resurrection. Saint Peter held up this cloth in the early morning light and saw the face of Jesus looking back at him in the dawn. This cloth proves that Jesus is not dead but risen even as he said! This is the face of Jesus which rests on a piece of byssus, a marvelous material made from the silk of mollusks and which changes with the light; sometimes his face disappears altogether and sometimes his face cannot be missed. Curiously, when we compare the dimensions of the Volto Santo, we find it is the exact same face as that of the Shroud of Turin and of the Santo Sudario. If the Volto Santo is the face of Jesus, then the Volto Santo is the misericordiae vultus, the face of mercy upon which Pope Francis urges us to direct our gaze throughout this extraordinary jubilee. What is more, this cloth, this face of mercy, is responsible for the first Jubilee of 1300 and played a significant and central role in the first jubilees. …I took the opportunity to show his Holiness the place in the chapel of St. Veronica which the Canons of the Basilica declare to be the so-called golden door which was wont to be opened by the Sovereign Pontiffs upon each hundredth year of the Jubilee, which I had also frequently heard said and maintained in common talk (in vulgo). His Holiness was of opinion that it ought to be opened in the same way at the time of the inauguration of the Jubilee, and he gave directions to have blocks of marble arranged and cut for the adorning of the said door to such height and width as the contour of the door showed on the inside, giving orders also that the walls in front and at the side of the said chapel should be entirely removed, that the people might pass through more freely. It was in the St. Veronica Chapel, built by Pope John VII in 705 in the space now occupied by Michelangelo’s Pieta, that the sacred image of the Volto Santo was housed until the early 1500s when it was brought to the village of Manoppello. Nestled and beloved in the Abruzzo region of Italy, it was almost forgotten by the outside world for more than four centuries. E’en thus, O Jesus, my true Lord and God? And was this semblance thine? Dante began his work on the Paradiso around 1308 and completed it in 1320.
and given to Veronica as a standard of love. which the spirits of the heavens desire to see. and guide us to the fellowship of the blessed. so fragile and unstable, quickly passing away. to see the face that is Christ indeed. our true joy and ultimate good! All that we can say of believing that Veronica, i.e., Berenice (Beronike – the medieval Greek pronuniciation of this word is practically identical with Veronica), may really have been an historical personage, though there is no sort of early authority for her meeting our Savior on the way to Calvary. Evidence, however, may be quoted for believing that the woman healed by our Lord of an issue of blood was named Berenice, and that she erected a statue in honor of her heavenly Physician at Paneas, in Syria, representing the scene of her own cure. The widely diffused notion that the name Veronica has something to do with vera ikon (true image) is a fallacy. Father Thurston may be right about the etymology of the word, but what then seems to be an accidental renaming of this woman could be providential, for the cloth – which has been wrongly attributed to her since the time of Innocent III – does indeed bear the true image of the Lord. But what does this image have to do with the jubilee? …it is interesting to find that the Bull of Boniface VIII, when prescribing the conditions of the Jubilee, makes no mention of the Sudario or Scala Santa or any other more or less doubtful relic as objects to be venerated during the pilgrimage – these were matters left to the pious devotion of the faithful; but it enjoins only a series of visits to the Basilicas of the Apostles, to wit, the Church of St. Peter at the Vatican, and the Church of St. Paul outside the walls. I remember that at the beginning of the last century my father who was a labourer, came to Rome and dwelt here as long as his means lasted, in order to gain the Indulgence. He bade me not to forget to come at the beginning of the next century, if I should live so long, which he did not think I should do. Seemingly unware of such an indulgence, the Holy Father asked the man what indulgence he sought. “A hundred days’ Indulgence every day of the year,” he answered. Other pilgrims confirmed they shared the same hope as the old man. Finding no written record of any such indulgence, the Pope sent his cardinals out to inquire what indulgences people hoped to receive through a visit to the Basilica of St. Peter. This oral testimony of anticipated indulgences in connection with a centennial year led to the issuance on February 22, 1300, of the papal bull proclaiming the Jubilee of 1300, which he said had already commenced on Christmas Day of 1299. Here it is good to remember that the Veronica was enshrined in the Vatican Basilica. Almost a century early, in 1208, Pope Innocent III proclaimed an annual procession with the Volto Santa from the Vatican basilica to Santo Spirito in Sassia. He also granted an indulgence to those who prayed before the Veronica. The succeeding pontiffs added additional indulgences to whomever prayed before the Volto Santo. Could these be the indulgences the pilgrims told the Cardinals about? Rather than being a feature of the jubilee, the we might say the Volto Santo was the cause of the jubilee. Indeed, the importance and inclusion of the Volto Santo in the first jubilee seems to have been foreseen, if not planned. The parchment on which the papal scribe Leo wrote to explain more precisely the requirements for obtaining the jubilee indulgence contains a curious work of art. At the top of the letter is an image of the face of Jesus (which bears a striking resemblance to the Volto Santo), flanked by Saints Peter and Paul. We find the same image at the bottom of the page, only it is upside down (and not reversed), a seeming reference to the fact that the Volto Santo is visible from both sides of the cloth. This suggests that, though looking upon the Volto Santo was not required per se to obtain the indulgence of the Jubilee of 1300, it was nonetheless of great importance for the pilgrims to Rome. Indeed, by the next jubilee, the pilgrims at least thought they were required to look upon the Holy Face as a condition of the indulgence. When Pope Boniface VIII established the Holy Year of Jubilee as a perpetual institution, he decreed that a jubilee should be celebrated every one hundred years. Pope Clement VI thought differently, though, and proclaimed and celebrated the second jubilee just fifty years after that of Boniface VIII in 1350. While Clement VI was at Avignon in 1349, it is said that a man holding two keys – presumably Saint Peter - appeared to him in a vision saying, “Open the door, and send fire forth from it, by which the whole world may be warmed and illuminated.” So it was that Pope Clement VI proclaimed the Jubilee of 1350. Whereas during the Jubilee of 1300 the Volto Santo was shown to pilgrims every Friday and feast day, throughout this second Jubilee, the faithful were given the opportunity to look upon the Volto Santo in the Basilica of St. Peter every Sunday, and every feast day. The number of the faithful desiring to look upon the Holy Face was so great “that many were suffocated or trampled to death.” The same would happen, as we shall see, one hundred years later. 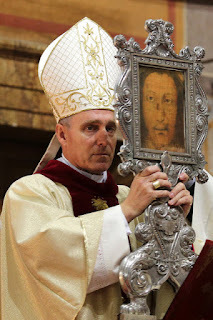 So important was the viewing of the Holy Face to the pilgrims that Alberic a Rosate quotes a document he says is a Jubilee Bull of Pope Clement VI describing the veneration of the Volto Santo as the culmination of the Jubilee pilgrimage. Though the authenticity of the document is of dubious origin, he “implies that to receive the blessing given with the Sudario was one of the necessary conditions for gaining the Indulgence.” Indeed, Thomas de Burton writes that “the sudarium of our Lord Jesus Christ would be shown to those arriving at the said holy city, and having seen this they would be absolved of their sins, and would have indulgence of them, restoring them to the state they were in on the day on which they received holy baptism.” Apparently, it was considered sufficient only to look upon the Volto Santo to have your sins forgiven. After all, looking on the Volto Santo is looking on the face of mercy. He in his soul’s strong purpose finds new force. A faint resemblance of thy matchless grace. How well it is for the Christian soul to behold the city [Rome] which is like a heaven on earth, full of the sacred bones and relics of the martyrs, and bedewed with the precious blood of these witnesses for truth; to look upon the image of our Saviour, venerable to all the world. Indeed, it seems that many opportunities were given for the faithful to venerate the Volto Santo even in 1399, before the Jubilee of 1400 began. I recollect that even in the beginning of the Christmas month a great many people came to Rome for the Jubilee. The pilgrims had to visit the four principle churches – the Romans for a whole month, the Italians for fourteen days, and the Ultramontanes [those coming from across the mountains] for eight. Such a crowd of pilgrims came all at once to Rome that the mills and bakeries were quite insufficient to provide bread for them. And the number of pilgrims daily increased, wherefore the Pope ordered the handkerchief of St. Veronica to be exposed every Sunday, and the heads of the Apostles, St. Peter and St. Paul every Saturday; the other relics in all the Roman churches were always exposed. The Pope solemnly gave his benediction at St. Peter’s every Sunday. Looking at the diary of Stefano Infessura, we can infer that the showing of the Volto Santo and the papal blessing occurred at the same time. “In the said year , on the 19th of December, which was a Saturday,” he says, “the sudario was shown to the pilgrims who were in Rome, and the pope gave his blessing to all the Christian people who were [in] the piazza of St. Peter’s.” Stefano goes on to tell us that a great tragedy happened after the blessing as the people left St. Peter’s Square. Curiously, Paolo di Benedetto di Cola dello Mastro recounts that the tragedy occurred not because the Volto Santo was shown that day, but because word went round about 4:00 p.m. that Pope Nicholas V would not give his customary benediction that evening and the pilgrims would not be shown the Volto Santo. Consequently, the pilgrims left the basilica by way of the Ponte Sant’Angelo. How we are to reconcile this discrepancy is uncertain. Either way, we know that a great mass of people left the area of the basilica at the same time and made to cross the Tiber over the Ponte Sant’Angelo. Paolo di Benedetto di Cola dello Mastro recounts that mules and horses became frightened and blocked the bridge, causing many pilgrims to be trampled underfoot or even pushed into the Tiber River. This led the castellan of the Castel Sant’Angelo to close the gate to the bridge. Even so, the fatal blockade lasted for an hour. Two chapels were constructed across the Tiber, one dedicated to Saint Mary Magdalene and the other to the Holy Innocents, where the Holy Mass was offered every day for the souls of the 172 victims who died in the stampede. These chapels were later replaced with statues of Saints Peter and Paul by Pope Clement VII (d. 1534) and remain there today. was pleased to leave the holy veronica, also an express image of his blessed face, as a keepsake to remain in honor among those who loved him, from the time of his bitter Passion to this day. Just as by the miracle of his blessed, holy hand it was imprinted and left on the sudarium, so by a similar miracle has it been, in that thin, corruptible cloth, kept and preserved uncorrupted these fifteen hundred years, fresh and easy to make out, to the inward comfort, spiritual rejoicing, and greatly increased fervor and devotion of the hearts of good Christian people. Why do we need such a keepsake? Moreover, why leave four different burial cloths behind? For the medieval people, however, such keepsakes were not enough. They longed to look upon the Volto Santo, it is true, but they wanted keepsakes of their own; they wanted visible and tangible reminders - early souvenirs, if you like - to commemorate their pilgrimage to the Face of God. Much as pilgrims to the shrine of the Apostle Saint James in Compostela, Spain returned home wearing the pilgrim shell, pilgrims to the Volto Santo returned home wearing patches bearing the Holy Face. Some even returned home with woodcuts of the image and still others with painted copies of the Holy Face. In effort to commemorate – and perhaps even restore – this central role of the Volto Santo in the jubilee – a copy of this remarkable relic was recently brought from Manoppello to Rome. It was taken in procession through St. Peter’s Square, through the Holy Door, to the chapel of the Pieta (where the original was once held), through the basilica to the pillar of Saint Veronica, and to the church of Santo Spirito in Sassia when it was venerated by many pilgrims. In his homily marking this historic celebration, His Excellency the Most Reverend George Ganswein called the Volto Santo “the distinctive sign of Christians” and “the first, the most noble, and the most precious treasure of all Christianity” and of all the earth.” The following day, His Excellency the Most Reverend Edmond Farhat called the Volto Santo “the definitive sign” of Jesus’ divinity. In this Jubilee of Mercy, how can we fail to look upon this sign and so, “with our eyes fixed on Jesus and his merciful gaze,” experience the fullness of his love? If we turn our eyes upon the Volto Santo and ponder this mysteries of the Face of Mercy, we can ponder, as Saint Anthony of Padua says, “how great will be the glory of standing before the Creator’s face, with the blessed spirits, with them to praise without end, and with him who is Life ever to live, and continuously to rejoice with an inexpressible joy.” By gazing upon his face here in this life, may we come to see him face to face. Amen! Pope Benedict XVI, Angelus Address, 9 August 2009. Pope Benedict XVI, Wednesday Audience Address, 29 April 2009. Pope Benedict XVI, Address to theClergy of Rome, 22 February 2007. Pope Francis, Misericordiae vultus, 8. Ibid., Prayer for the Jubilee of Mercy. Pope Benedict XVI, MeditationDuring a Pastoral Visit to the Pontifical Shrine of Pompeii, 19 October 2008. Pope Francis, Prayer for the Jubilee of Mercy. Preface I, Mass of the Ascension of the Lord. Pope Francis, Misericordiae vultus, 9. Paul Badde, The True Icon: From the Shroud of Turin to the Veil of Manoppello, trans. Michael J. Miller (San Francisco: Ignatius Press, 2012), 18. Ibid., The Face of God: The Rediscovery of the True Face of Jesus, trans. Henry Taylor (San Francisco: Ignatius Press, 2010), 244. Pope Francis, Misericordiae vultus, 6. In Herbert Thurston, S.J., The Holy Year of Jubilee: An Account of the History and Ceremonial of the Roman Jubilee (Westminster, MD: The Newman Press, 1949), 31. See especially Paul Badde, The Face of God, 69-144 and The True Icon, 88-96. See also Eugenio di Giamberardino, The Holy Face of Manoppello: Tradition, History, Science and Devotion, 21-25 and Heinrich Pfeiffer, Il Volto Santo di Manoppello, 2d ed. (Pescara, Italy: Carsa Edizioni, 2012), 16-23. Herbert Thurston, S.J., The Holy Year of Jubilee, 153. Dante, Paradiso, XXXI.11.103-108. Translation in Herbert Thurston, S.J., The Holy Year of Jubilee, 153. Translation in Herbert Thurston, S. J., The Holy Year of Jubilee, 58-59. Herbert Thurston, S.J., The Holy Year of Jubilee, 154. Diana Webb, Pilgrims and Pilgrimage in the Medieval West (London: I.B. Tauris Publishers, 1999), 66. Giovanni Villani, Nuova Cronica, 9.36. In Diana Webb, Pilgrims and Pilgrimage in the Medieval West, 117. In Herbert Thurston, S.J., The Holy Year of Jubilee, 13. Cf. Paul Badde, The Face of God, 135-136. Thomas de Burton, Chronica Monasterii de Melsa, ed. E. A. Bond in Rolls Series 42, 88-89. In Diana Webb, Pilgrims and Pilgrimage in the Medieval West, 78. Herbert Thurston, S.J., The Holy Year of Jubilee, 58. In Herbert Thurston, S.J., The Holy Year of Jubilee, 58-59. Petrarch, Epist. De Rebus Famil., xii.7. In Herbert Thurston, S.J., The Holy Year of Jubilee, 139. There is some question as to whether a jubilee was actually held in 1400. Cf. Herbert Thurston, S.J., The Holy Year of Jubilee, 63. Ser Luca Dominici, Cronache di Ser Luca Dominici, ed. G. C. Gigliotti (2 vols, Pistoia: 1993), 175-176. In Diana Webb, Pilgrims and Pilgrimage in the Medieval West, 158. Ibid., 180-181. In ibid., 159. Ibid., 233. In ibid., 160. Paolo di Benedetto di Cola dello Mastro, Cronache Romane, 16-20. In Herbert Thurston, S.J., The Holy Year of Jubilee, 66-67. Ibid., 18. In Ludwig Pastor, The History of the Popes: From the Close of the Middle Ages, Vol. II. Frederick Ignatius Antrobus, ed. (London: Routledge & Kegan Paul, Ltd., 1949), 89. Diario della Citta di Roma di Stefano Infessura, 5. In Diana Webb, Pilgrims and Pilgrimage in the Medieval West, 121. Paolo di Benedetto di Cola dello Mastro, Cronache Romane, 18. In Herbert Thurston, S.J., The Holy Year of Jubilee, 69. In Guiseppe Marcotti, Il Giubileo dell’anno 1450, in Archirio di Storio Patria, iv., 569-570. Quoted in Herbert Thurston, S.J., The Holy Year of Jubilee, 39. Saint Thomas More, Dialogue Concerning Heresies, ___. Mary Gottschalk, ed. (_____: Scepter Publishers, 2006), ___. Pope Francis, Misericordiae vultus, 21. Cf. Diana Webb, Pilgrims and Pilgrimage in the Medieval West, 128. Herbert Thurston, S.J., The Holy Year of Jubilee, 40. Pope Francis, Misericordiae vultus, 3. 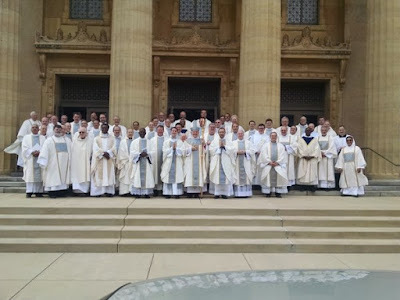 Archbishop Georg Ganswein, Homily at Santo Spirito in Sassia, 16 January 2016. Archbishop Edmond Y. Farhat, Homily at Santo Spirito in Sassia, 17 January 2016. Saint Anthony of Padua, Sermon for the Ascension of the Lord, 5. In Sermons for Sundays and Festivals, Vol. IV: Sermons for Festivals and Indexes, trans. Paul Spilsbury. (Padua: Aedizioni Messaggero Padova, 2010), 251.